It looks like a good problem to have Will! I have sooo much kratom my house is overflowing with Kratom! It looks green vein in the pictures..is that correct? Are you just air drying and then milling your own. I have some questions on drying and exposure to air and UV/sunlight….i have a fragment of a report that discusses the oxidation effect but never anybody that had fresh leaf to ask questions. Have you tried chewing fresh leaf like traditional native use...that would be very interesting if the effects are markedly different than dried milled product..
Well I have an issue with the whole strain deal honestly. The trees are said to be of pink/ red vein stock. However I've seen all my trees display everything from purple to green or white depending on the branch I happen to be looking at. The former happens when the trees are undergoing heavy growth with tons of son light, producing a leaf that my friends prize for it's pain relieving properties. Vendors have been making up strains since I can remember. 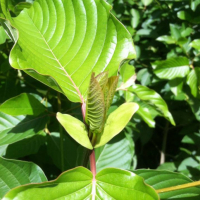 All I know what is good kratom and what isn't. This is good. Yes I've been able to enjoy many methods of consumption I won't get into here, including chewing the leaf. It is horribly bitter though, most people can't tolerate it for very long at all. In general I air dry, but I have started building a drying rack in the full sun. Mainly because I'm playing with the flavours a little bit. Another thing I have collected samples of my leaf since I started growing and have them all to this day, it is the only way I've been able to really track the changes in the make up of the leaf. The last two years have been brilliant, interestingly this is also when the trees started flowering, since that day they haven't stopped. [attachment=34]Sounds like once they hit maturity they flower continually…hmmm so 3-5 years for a mature plant if its healthy. So you are getting multiple vein colors off the same clone now mature tree...I makes sense that at different points of the year ,weather/sunlight ,etc could make leaf variation...but that trees that produce only green vein are not receiving due to location or environment as much of something....thoughts? I found that research fragment, I have been saving it for just such an occasion. its tough to see but it briefly touches on the UV/oxygen oxidation which may explain why on those super sunny grows that more of the pain relief alkaloids are being produced or converted. Your outside drying racks look like at least at first blush might increase that as well. So just learned something new… for all those years in flower i've only seen one type of mature "pod". Turns out there is at least two, since now?.. i'm guessing both of the sexes, but I honestly have no idea. This is why we need to study these plants. I can only do so much, but hell i'm happy to be able to go this far. I'll put up some pics to compare if you are interested. Yes please on the pictures…so 2 types of pods on 1 tree or male female trees? I would love to see some closeups of the growth tips on the branches. Thank you. Will, I may have missed some of your story somewhere but are you residing in SE Asia? Those leaves look great! Strain names annoy me too. Not to speak for Will but it looks like he has found a microclime here in the states…..you really should look at his other posts in cultivation...the trees are remarkable..its an amazing insight to the plants. I have never seen mature trees and been able to really dig into the how and why of the plant. Every time will posts about them I have more questions! Thanks Aegis. My curiosity has definitely peaked! I'll leave it to your fertile imaginations. But really my life isn't that much fun.